Some of you have asked me for an update on the newlywed Georges. As most of you know, last September they let us know they were going to transition back to the states to start their family and new life together. They graciously volunteered to stay with us until Wes, Nicy and family had relocated here in March. So after months of preparation and saying good bye, on March 22, we sent them off with all our love and blessings. We love and miss them and all of us at Alex's House send them our love. Bondye beni nou Kendall & Patrick! We proudly introduce the two newest family member's of Alex's House, Diore(pronounced like Joey) and Lourdemia. 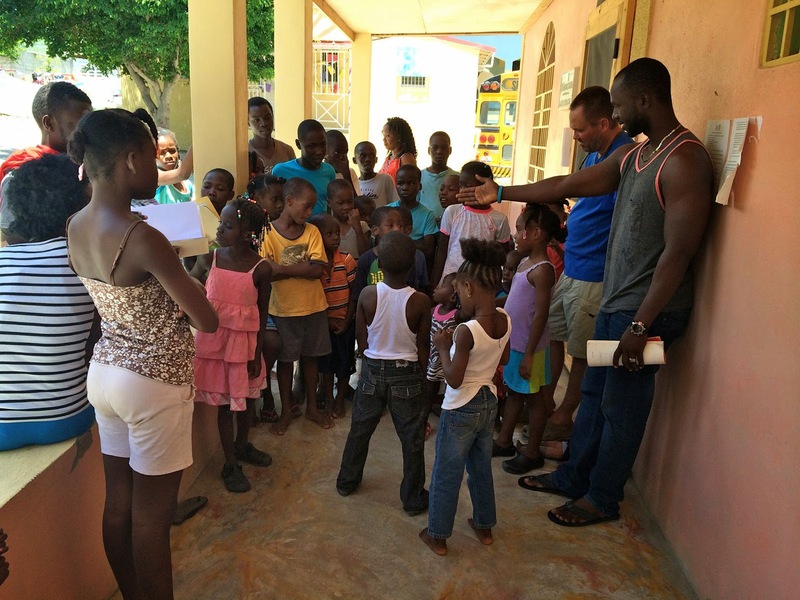 They were brought to Alex's House several months ago by IBERS, the Haitian governing body of orphanages. Their mother is severely disabled and unable to continue caring for them. We took them in to foster will IBERS further investigated their situation. They are now officially a part of the Alex's House family. Diore is such a great big brother. On one of pairs first days at Alex's House, he brought over his water cup for Lourdemia because she hadn't received one yet. We explained that she would get her own cup of water and he could keep his! He does great with school work. Micky keeps him in line and makes sure he knows his lesson each day for school. Like most other Haitian boys, Diore loves to play soccer. He has a big smile and is just a generally content eight year old! Lourdemia is a lively, extremely girly seven year old. She loves having her hair fixed and likes to fix others hair. Her naturing side can be seen when she is playing(ok sometimes bossing)Widena and Wislove. Lourdemia loves to play with dolls and fashion new clothes for them. She has the cutest snaggled tooth grin! Both children are in need of full sponsorship-Daily Bread, Child to School, and Life Skills. If you would like more information on sponsoring Diore or Lourdemia, please contact our Sponsorship Director Monica Langdale at monica@alexshouseorphanage.org. We hope you come to visit us soon and meet our new family members! Church(Kentucky) in January. 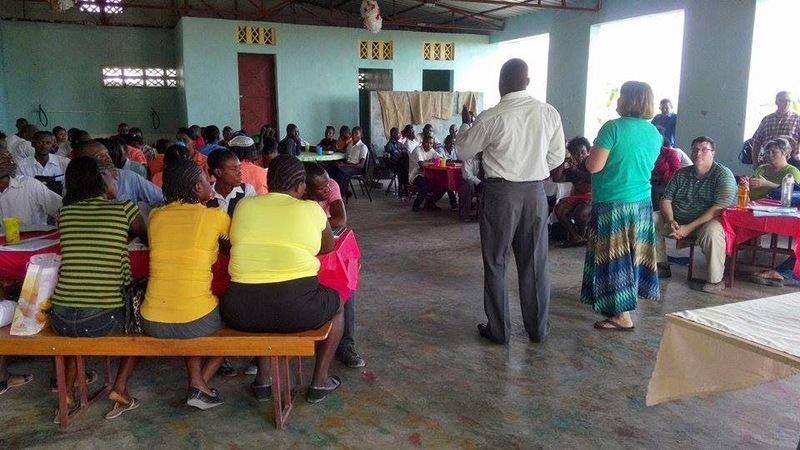 Over 50 Haitian workers and pastors from our partnering churches attended the training. The team of ten workers from Hope Community Church have a combined total of 192 years working with children! They used their experiences in ministry to develop a conference focused on the why of teaching children, the how of practical methods and the importance of prayer in ministry. Each day a variety of sessions including teaching, small group challenges, discussion questions, worship and demonstrations were presented. Teaching sessions focused on why it is important to teach children, the differences in teaching children and adults, how to use objects from your surroundings to enhance teaching and different methods for conveying a message. Attendees were split into groups and given different passages that teach about the importance of children. Discussion prompts directed them to look at how children were involved in the scripture and what that says about the importance of children. After studying the passage in their small groups, they presented the meaning of the passage to the large group. Attendees took the studying very seriously and had great insight to share with the group. A presenter spoke on the differences in teaching children versus adults. This lesson was one that really resounded with the pastors and leaders. In a follow-up discussion with Pastor Frito of Pierre Payen, he told Conference Director Steve Haddix that he had been teaching his children as if they were adults. From the conference, he learned children cannot learn in the same way as adults. He plans to get volunteers from his church to teach children separately now on Sunday mornings. 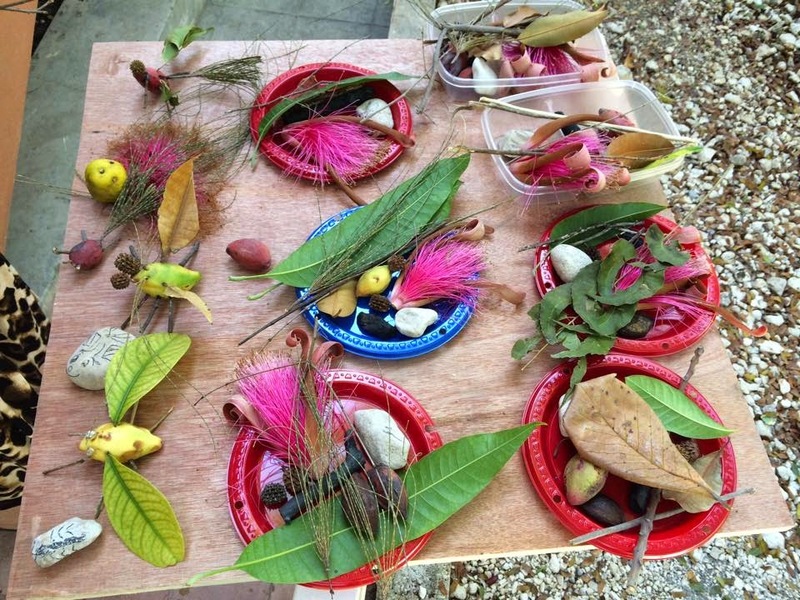 One of the challenges given to teams included giving each group items collected around the York House yard to create bugs. This demonstration taught participants to think outside the box for items they already have available to create crafts, teaching props, etc. For one session, Hope member Ricky Hall taught the story of David and Goliath in costume as if he were David. He showed the group how interactive storytelling captures the audience and helps them to grasp the concept better than simply standing in one place reciting a lesson. The group gave examples of how to teach through music using hand motions, reading a story from a book using character voices and having children involved in a skit. After the session, groups were given a story prompt and had to come up with the best method to share the story with a group. They first had to identify the main point of the story and then tell how to best teach it. Several groups said a skit was the best teaching method while another used finger puppets to demonstrate their main point. Conference Director Steve Haddix said he was uncertain of the reception his team would receive going into the conference. Would the methods used in US to teach children translate cross- culturally? At the conclusion of the three day conference he was blown away with the level of participation by attendees. 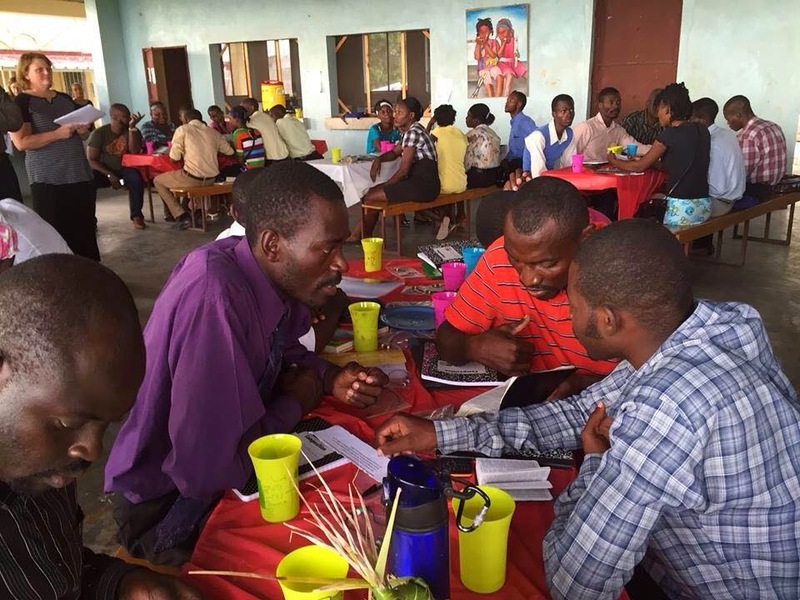 He had several post conference discussions with pastors who were eager to implement the teaching methods they learned. Alex's House extends a huge thank you to the members of Hope Community Church who spent many hours prepping for the conference! 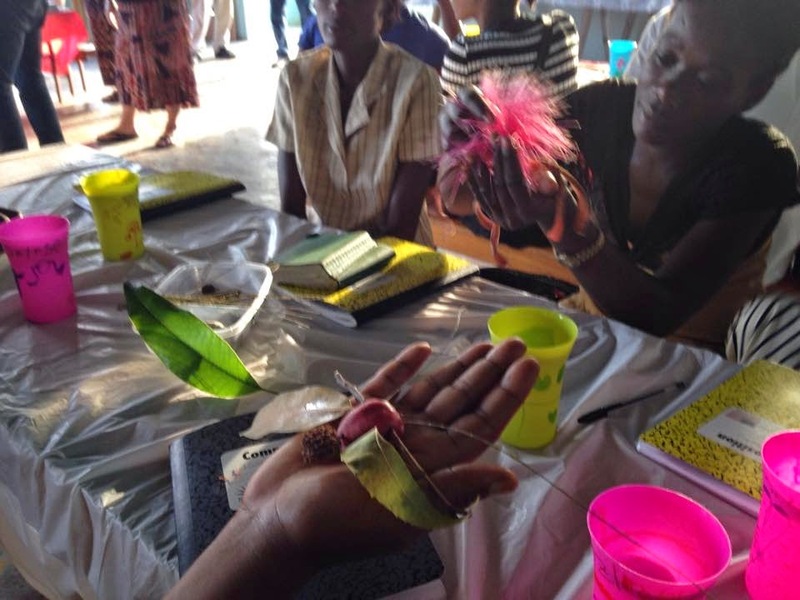 We pray that the training will impact many children in Haiti for the gospel. Are you an online shopper? You can use your shopping to help support Alex’s House when making purchases on Amazon.com! 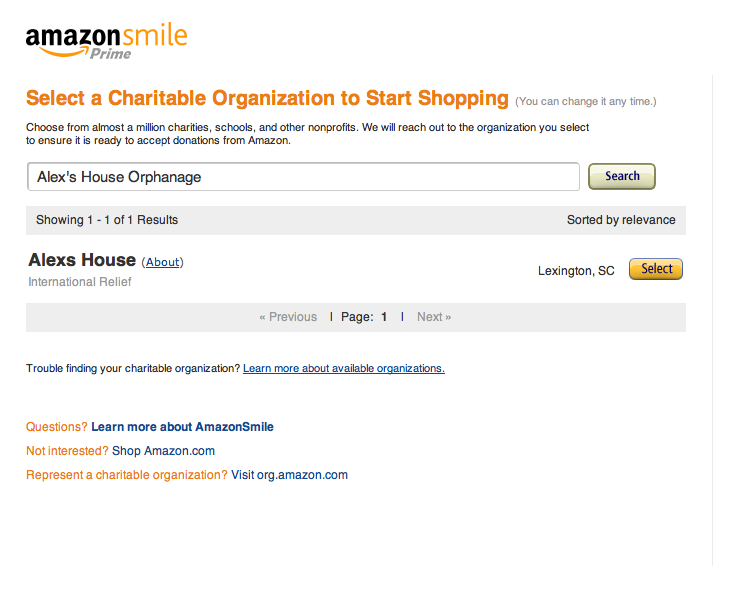 Amazon Smile is the same website, however, it allows you to designate a non-profit to receive a portion of your sale. When shopping online go to amazonsmile.com and sign-in using your Amazon username and password. Next search for Alex’s House Orphanage as your charitable organization. Select Alex’s House(Lexington, SC) as the organization you want to support. Now as you shop, your purchases will help support Alex’s House. It’s a simply way to give back while you do what you were already doing. Simply make the switch to amazonsmile.com for your online Amazon purchases. Share this easy way to give to Alex’s House with other online shoppers today! Our Next Step - Piercing the Darkness! I want you to know how grateful I am for the love, support and prayers you offered Alex’s House in 2014. Our children are happy and growing and through you, the Lord has met all of our needs. Your love and support is literally changing the lives of our children! This February will be a great milestone in our history – our 5th anniversary! I stand in awe at the amazing progress the Lord has allowed us to make in these few short years. Yet, there’s a trembling in my spirit as well - for as you know, the Lord does not allow us to stay in one place for very long. The Lord has given me clarity in where we should go next. Please click on the following link and watch our new video – Piercing the Darkness. The video and the information that follows it will tell you all about our next steps forward! After watching, if you agree that the Lord is calling us in these new efforts, please make a generous donation to help the vision become a reality. You have been so faithful in standing with me in this calling to reach Haiti for Jesus. Thank you for your faithful financial support, your prayers and your friendship. I’m so grateful to be in ministry together with you. …for the least of these…. By the end of 2014, over 250 people will have served on mission teams at Alex's House within the year! We had team members from Colorado to West Virginia, from Michigan to Alabama and New Mexico to South Carolina. 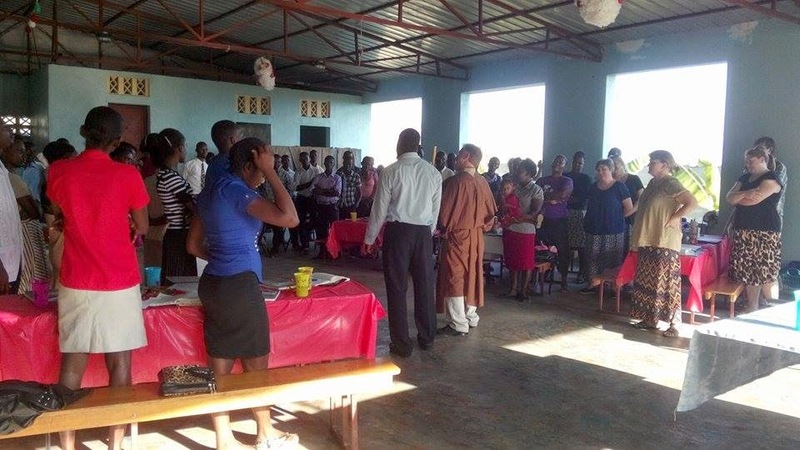 Because of the reach of these teams, Alex's House held medical clinics, trained leaders in children's ministry, taught adult Bible classes and ministered to local widows. Mission teams allow us to go beyond the walls of the children's home to minister in the local communities. We hope you can join us in 2015 as we continue to reach the least of these for Christ. This next year we will continue with children's ministry, adult ministry, women's ministry, sports ministry and medical missions at our ministry sites. In addition, the Lord has shown us the need to hold deeper training sessions for local leaders. We will host children leaders training, youth ministry training, pastors training and worship leaders training conferences in 2015. Alex's House invites you to join us in 2015 to be a part of the work the Lord is continuing in Haiti. Check out our missions page for next year's schedule. If you have a church or missions group that would like schedule a trip, please contact our Missions Director, Kendall Moss at kendall@alexshouseorphanage.org. We look forward to serving with you in 2015! Alex's House Orphanage. Picture Window theme. Powered by Blogger.